Greetings. This month I want to share some very special new work by Stephen Rolfe Powell and an interview I did with Stephen recently. 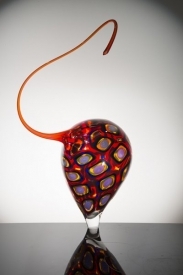 Stephen has long been one of my favorite American glass artists, both as an artist and as a person. In addition, I am featuring new works by Lino Tagliapietra, Nancy Callan, Hiroshi Yamano, John Kiley and a wonderful new small scale piece from the Man Adorned series by William Morris that has just come onto the secondary market. I hope you enjoy this edition of Holsten Galleries News and, as always, I welcome your comments and questions. Enjoy the rest of your summer! K: You’ve been blowing glass now for a long time. Please remind me of how you got started in glass. 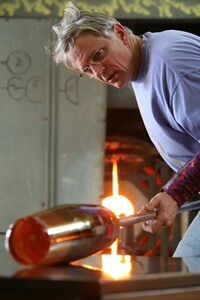 S: When I was 28 years old I started to work on an MFA degree at Louisiana State University with a specialty in ceramics but I was also very drawn to the physicality of glassblowing and to the interaction of glass with light. I visited New Orleans frequently because they had a glass program at Tulane. I considered switching my emphasis from ceramics to glass but ended up completing my MFA in ceramics. Then in 1983 I got my first teaching job at Centre College in Danville, KY. I was mainly teaching ceramics but I knew right away that I wanted to develop a glass program there. I taught both glass and ceramics for many years at Centre before switching completely to glass. K: Tell me about your new series. I love the large murini. These pieces are very painterly. S: Exactly, I was interested in making pieces which are more painterly. This work is more about color than pattern. I’ve always had a strong interest in the color field painters like Davis, Rothko and Noland. And more recently Sean Scully. K: Prior to this new body of work is there a series which you particularly like or enjoyed making? S: I loved making the recent Echo series. Those large, thick bowl forms allowed me to explore the refractory quality of glass more than ever before. K: In addition to being one of our leading glass artists I know that you are also a great teacher. You’ve been at Centre College now for over 30 years and I know that you are very loved by your students, some of whom have gone on to become professional artists. Tell me about that part of your life. S: I really think I teach more through osmosis than from classroom lectures. One of my greatest teaching moments actually involved me learning something new in the presence of my students and then teaching while learning. I wanted to blow those large bowl forms in the Echo series but I wasn’t sure where to start. I often talk with Lino and consider him to be a close friend and mentor so I asked him for advice. Soon after that I received a 300 pound shipment from Italy. Lino had sent me these very large wooden molds to use for the bowls. Then he called to say that he might as well fly to Danville to show me how to use them. This was going to happen on a Saturday and I told my students that a surprise guest was coming to work with me and invited them to stop by the studio on that day. Imagine their shock when they saw Lino there working with me. This is the kind of experience which you just don’t forget. K: Speaking of Lino, I know that you and Lino have been close for a long time and that he has come to Centre to work with you numerous times. I was lucky enough to be present when Lino was awarded an honorary doctorate there, along with Judge Sandra Day O’Connor. What would you say has been Lino’s greatest influence in your art? S: Lino has influenced almost everything about the way I make glass. However, I would say that his most important influence has been in how I live. Lino’s curiosity and appreciation of life has been a huge influence in my own life. Take food, for example. I have learned so much about enjoying good food and cooking from Lino! K: If you were to choose another field of work what might that be? S: The first thing that comes to mind is that I would love to be a great chef! Recently I was able to choose some wonderful new Lino Tagliapietra inventory in Seattle. Next month I will be featuring all of the new work but for now I have selected this outstanding piece from Lino’s "Dinosaur" series. Rather smaller than most pieces from this signature series, this piece combines a wonderful spectrum of colors with a superb form. If, as I say below, the Hiroshi Yamano piece might prompt an "aha" moment for the viewer, this new Callan work elicits more of a "wow!" Nancy has certainly created other murini Tops in the past but here the patterning is much freer, almost a bit wild. I like it! I love this piece which John Kiley recently made available. 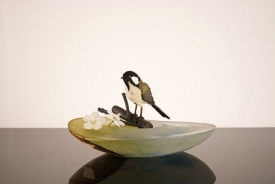 The subtle shading of green, the subdued form, the balance, all add up to a breathtakingly beautiful glass sculpture. This new piece by Hiroshi Yamano is deceptively simple. Like many forms of Japanese art (think haiku, origami, etc.) more can sometimes be less. The experience here is more of an "aha" than a "wow." And certainly there is room for both in a good art collection. This outstanding small-scale William Morris piece has recently come on to the secondary market. Most of Morris’s figurative glass sculpture was made on a much larger scale. Of the few smaller figurative works that I have seen over the years, this is one of the very best. Thank you for taking time to read this month’s edition of Holsten Galleries News and take care!